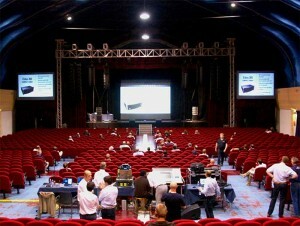 CADAC and Outline co-hosted a four-day international distributor event at the end of September. The event held in the Pala Banco di Brecia, in Lombardia, Italy, saw the legendary live sound companies present a rolling schedule of product demonstrations, and ‘breakout’ hands-on demos and workshops. The event was attended by more than 100 industry professionals, comprising CADAC and Outline distributors and their principal customers from some 15 countries, across Europe, Scandinavia, the Middle East and Asia; these included representatives from leading hire companies, sound designers and engineers. Commenting on the objectives of the event, CADAC marketing manager James Godbehear says: "The intention was to get CADAC’s new console offerings in front of a wide breadth of potential customers. The majority of those in attendance had not seen the product before. The event presented the opportunity for them to engage with the CADAC brand and to get hands-on time with the consoles." "We had the CDC eight-32 with the I/O 6448 expansion rack, two CDC fours with I/O 3216 expansion racks – running the latest V1.29 software, featuring I/O mapping on the expansion rack –plus all three frame sizes of the LIVE1," continues brand development manager Richard Ferriday. "It gave us the opportunity to show and demonstrate the latest developments, including the new effects package and further GUI improvements on the CDC eight, and the new MADI to CADAC MegaCOMMS network bridge, as well as providing advanced information on soon to be announced co-development initiatives for the CDC eight console system." In recent months CADAC has been actively expanding and upgrading its international distributor network, and many of its newest distribution partners attended the event. "This was an important step in building these distributor relationships," says international sales manager Ben Millson, "The distributors were able to get the sense, first hand, that we have moved on from the design and initial build process, and that final development has gathered pace, with the company focused on delivering specific requirements for their market sectors, with so many of the features and capabilities that they have asked for. This was a majorly successful event for us, and there was a tangible sense among those attending that there is definitely nothing out there with a user interface as intuitive as the CDC eight, and nothing else that sounds like it. Many are now referring to it as a ‘third generation digital console’."